WASHINGTON — The Senate Commerce Committee’s approval on Aug. 2 of Steven Bradbury’s nomination for general counsel at the U.S. Department of Transportation was a step forward in staffing up Secretary Elaine Chao’s leadership team. 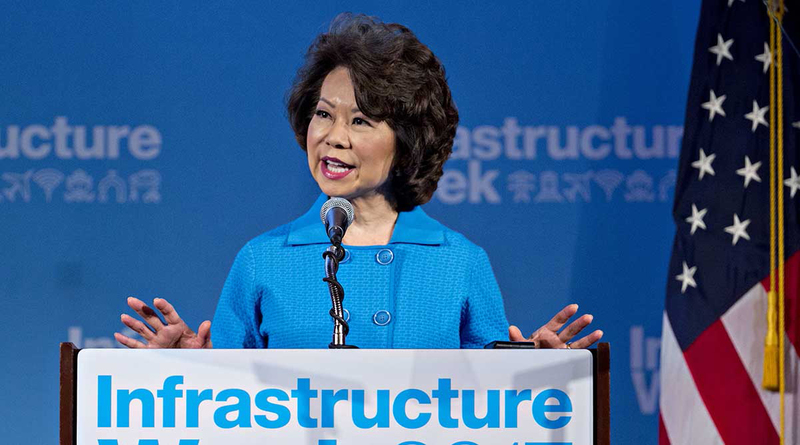 Yet, to do more to help ensure Chao realizes President Donald Trump’s goal of modernizing roadways, airports, and bridges, her staff needs to grow, Commerce Committee Chairman John Thune (R-S.D.) told reporters after his panel advanced Bradbury’s nomination to the Senate floor. “We want to give [Chao] a full team to work with,” Thune said. “I know she’s been a little bit undermanned over there in terms of having a lot of key positions filled. So we’re anxious to get her team in place. “I think, if she adds people and can sort of start handing off some of the workload, things will get a little bit easier for her,” Thune added, noting he’s yet to hear from the administration about a nominee to lead the Federal Motor Carrier Safety Administration. DOT’s trucking regulatory agency is led by acting Administrator Daphne Jefferson, a holdover from the Obama administration. Operating without a Trump appointee at the helm, FMCSA is tasked with reforming its Compliance, Safety, Accountability scoring system for carriers, as well as educating the industry on an electronic logging device mandate. President Trump has blamed Democrats for slowing down the confirmations of his nominees. Several Democrats in the Senate counter Trump’s argument by noting several nominees either lack strong qualifications or are controversial picks. In the case of Bradbury, Sen. Tammy Duckworth (D-Ill.) joined a dozen other Democrats in voting against him in committee. She since has placed a hold on his nomination, a procedure impeding a vote in the chamber. At issue is Bradbury’s role while at the Department of Justice related to enhanced interrogation techniques. Meanwhile, Senate leaders indicated they would facilitate the confirmation process for noncontroversial nominees, a move praised by the National Governors Association.